Last year, a new trail system was installed down at the research station. For the first few years the trails we used were just a network of well-worn dirt tracks, tramped down by many feet over many years, in most spots only a single person wide. 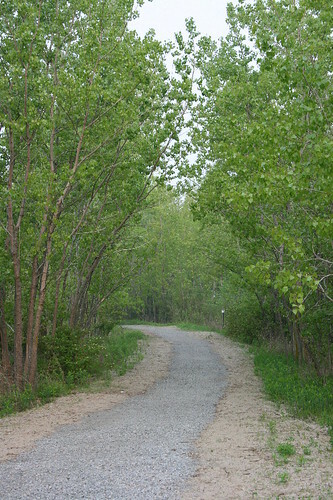 As part of a park accessibility plan, a new crushed-gravel trail was put in place over the primary dirt ones. The idea is that it’s a wheelchair-accessible substrate, that will allow handicapped park visitors to come see other areas of the park. I think it’s also intended to help better define the trail system to encourage folks to hopefully not wander into the bushes. When they first installed the trail they had to bulldoze a car-sized wide gouge out along where the new trail was to go. 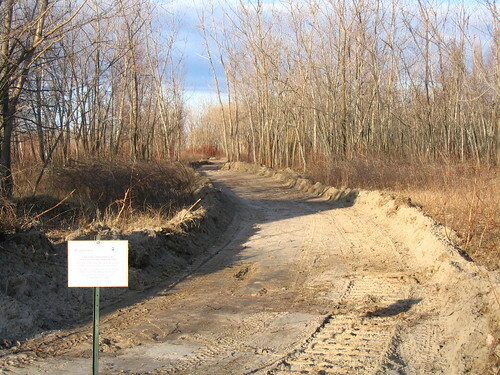 This is a heavy-duty, permanent trail that went in, with a full gravel bed laid down first over which the crushed gravel was placed and packed. As well, an earth bridge with a culvert was placed over the small slough that runs along the peninsula’s length, to connect one side of the trail to the other. The bulldozed section had to be wide enough to accommodate the backhoe and trucks that were bringing in the materials and gravel. It was quite a scene down there for a while while they were working. The final trail was only intended to be about half the width of a dump truck, so after the crushed gravel went down, the sides had to be filled in. Because the area is mostly sand, sand was also used to edge the trail off. However, at some point late in the summer there was a mixup, and one section was edged with topsoil. It was later corrected and sand put down, but some of the topsoil remained under the sand. 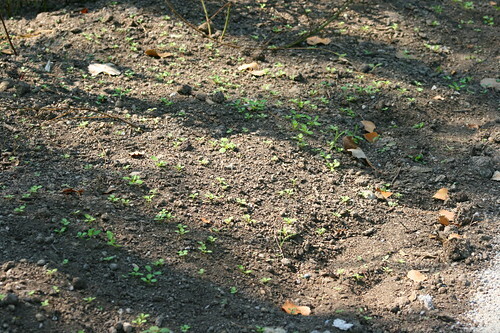 It didn’t take long for us to start seeing small sprouts peeking through the sand. I couldn’t tell what they were at the time, but they seemed to be hardy, whatever they were. They grew into small rosettes of leaves that got covered up with snow in the winter. When it melted back they were still there and still green, and I was intrigued to see what they became. As they grew, the winter rosette gradually yellowed and died back and new foliage replaced it. When they were about six inches tall they started blooming, and I thought they’d reached their finished height. But they continued growing, and some are now over a foot and a half tall. They create a pleasant spray of white-on-green through this section of the trail, and although I knew they must be considered invasive weeds to have sprouted so enthusiastically from some scrapes of topsoil, I can’t help but like the way they look lining the trail. I took some photos today while I was down there, and using the online wildflower identification key that Jennifer at A Passion For Nature posted about recently, I attempted to figure out what they were. Although my assessment of the size of the flowers was off I did end up finding out what they are. In the above photo you can see two types. 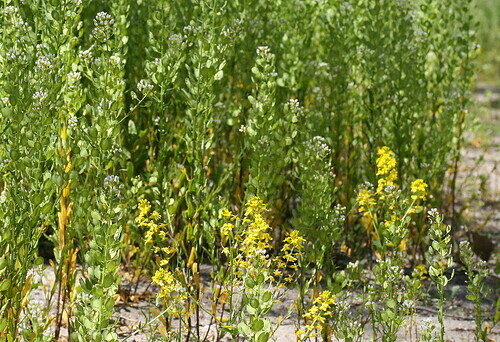 The white ones are called Field Pennycress (Thlaspi arvense), and the yellow ones are Yellow Rocket aka Winter Cress (Barbarea vulgaris). As I suspected, both are introduced species to North America. 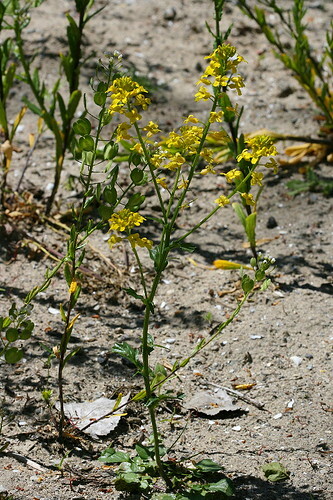 They’re both originally native to Europe, and could’ve either been escapees from cultivated gardens, or accidentally introduced in cargo shipments, but probably the former – I found no mention of believed release site or information in the bit of searching I did, but did find something that suggested early settlers to North America used the Yellow Rocket to prevent scurvy. They’re also both members of the mustard family, Brassicaceae. 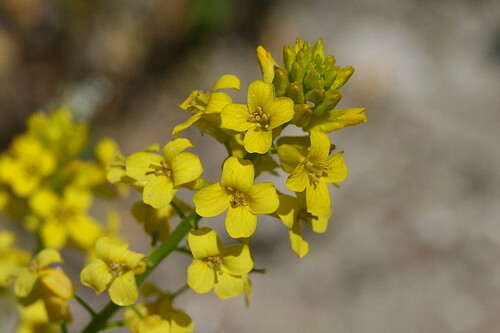 I think of mustards as being these light yellow flowers, similar to Yellow Rocket, but in fact it’s a very broad, widely-encompassing family that includes such well-known plants as cabbage, cauliflower, turnip and radish, as well as garden flowers such as Alyssum and wallflowers. All members of the mustard family have four-petaled flowers. In the case of the Field Pennycress, the flowers were all somewhat flattened, making it hard to see inside them. 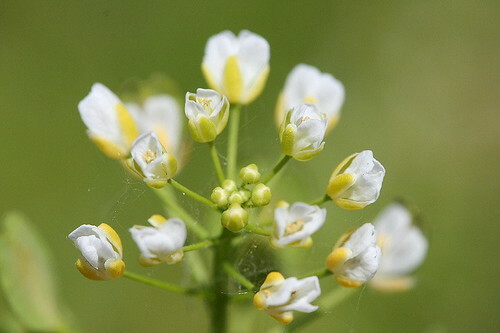 For both species, the flowers grew along long stalks, which continued growing from the tip as more flowers were produced. You can get an idea of that here, with the center containing many buds that have yet to develop and the outer flowers growing from different points along the stem. 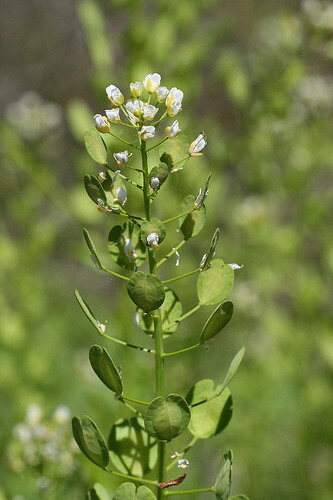 As the pennycress flowers mature, they begin to form seed pods, and the older flower stems, further down the stalk, support broad, flat, disc-like pods. The plant is capable of self-pollination, so doesn’t require other plants to develop fertile seeds – even though that hardly seemed like a problem here. Once the seeds are mature, the pods brown and drop from the plant, and are blown about in the wind as their primary dispersal method, potentially as far as 1 km (about 0.6 mi) from their parent plant. 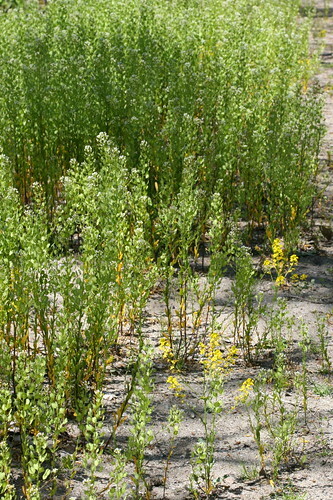 Pennycress seeds can last for a long time if buried in the soil. Depending on the depth the seed is buried, it may remain viable for as long as 30 years. I have to wonder just how old these seeds were prior to being spread out along our trail edges. The Yellow Rocket didn’t seem to be forming seeds yet, but does so and spreads them in a similar manner. Both species are inhabitants of disturbed sites such as roadsides, ditches, so-called “waste” areas, and agricultural fields. They prefer slightly moist soil, but will evidently grow in a variety of soil types, with varying degrees of vigour. Apparently disturbance is a key factor, and neither will grow very well in more high-quality habitats, so while they’re non-native, they’re not particularly invasive, and don’t threaten to run rampant over native species the way some introductions do. Although the foliage of these plants is apparently edible (stated by a few sites, but also shown by its use as a scurvy-preventative), I didn’t feel tempted to try it. The leaves are apparently quite bitter except when young, and one site noted that the milk from cows that have been feeding on pennycress has a distinctly “off” flavour (this is probably only noticable in small-batch or family-scale milking operations, though). I’m glad to learn that, although they’re certainly robust, they’re not aggressive species. It allows my mind to rest easier while I’m enjoying them at the trailsides. I know some people take offense to introduced species simply because they’re non-native, but I’m of more a live-and-let-live mindset – if they’re not taking over the place, let’s just leave them be and enjoy them. EO Wilson spoke at Chautauqua a couple of summers ago… he observed that often the invasives seem bad at first, but eventually, they balance with the natives. He gave purple loosestrife as an example: at first it seems to kick the cattails out. But over time, the cattails return and the two live together in harmony (and produce very pretty stands of purple and brown). It’s good to know that things like Purple Loosestrife and tent caterpillars aren’t as evil as I had understood them to be. I still don’t like the damage I’ve seen caused by Dog-strangling Vine, though. EO Wilson is another of those people I really admire, Winterwoman, and it would’ve been neat to have the chance to hear him speak. It’s true what he says, and the loosestrife is a great example. A professor I had at university had a real thing about loosestrife – as a defender. Some of his students had been working on the projects that showed that it’s not as bad as first thought, and in fact their results seemed to indicate that it actually increased insect biodiversity, not decreased it, because it increased the structural complexity of the habitat. It’s true that I know of no wetland where it’s completely taken over, it seems to have reached an equilibrium with the native species. Lavenderbay, I think the Dog-strangling Vine would be the exception, it’s one of those extremely aggressive invasives that just runs rampant on a place. It’s taken over large parts of the Rouge in the east, and is starting to get bad in some areas of the Don Valley, though it’s still relatively absent from the west (in my experience of the areas). When I worked for the Toronto Zoo doing bird surveys of the valley there, I recall huge, uniform expanses of the stuff that was next to impossible to wade through. Horsin’around, it’s true that garlic mustard is a particularly pernicious invasive, much like dog-strangling vine. I didn’t realize that it was so distructive to local symbiotic relationships, though. There’s certainly lots of it around, unfortunately, and I do anticipate it will likely end up featured in the future.